There are a couple of foods that I always associate with trips to New England and the beach. The first is Campbell’s classic chicken noodle soup (not sure why? ), and the other is salt water taffy. I love the big boxes of mixed flavor salt water taffy, but it never seems to last long enough ( really, is there such a thing as lasting long enough when it comes to salt water taffy?) Turns out, it’s not that hard to make, and now I can have salt water taffy any time I want, not just every few years on vacation. And I know that I could probably buy it at Walmart, but it’s just not the same. Somehow making it at home doesn’t wreck the nostalgia factor like I know buying taffy from a big-box store would. This is a great recipe to make if you have a husband or other helper, since stretching the taffy is a pretty good workout. It’s what gives the salt water taffy its classic light and chewy texture, though, so it’s got to be done. I pulled a batch by myself the other day, watching an episode of Law and Order (SVU, of course. Is there anything else?) to pass the time, and it wasn’t bad at all, though it does get a bit hard to pull when it’s close to being done. 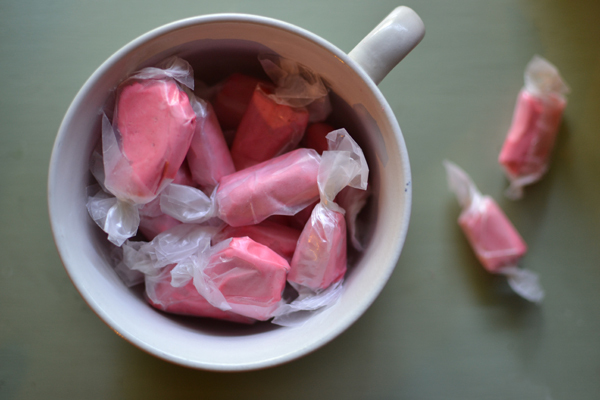 Before we get started with the recipe, a couple pieces of advice: choose a not-so-humid day to make your taffy. Too much moisture in the air will cause the outside of the taffy to get really sticky before it even cools, which ends up being a huge mess. If you have A/C, just crank it up and you’ll probably be fine. Also, the temperatures I’m including in this recipe are just guidelines. I’ve seen recipes calling for temperatures ranging from 250°-280° (which sounds bonkers to me). I like my taffy right around 254°. If you make it and want your taffy to be firmer, just adjust the temperature a few degrees. A lower temperature will make softer taffy.Trial and error, folks. About 1 t. (more or less to taste) flavoring extract. * Peppermint is my favorite! A few drops of food coloring, if you want colored taffy. Mix the sugar and cornstarch in a medium saucepan. Add the corn syrup, water, butter, and salt. Cook over medium heat until the sugar dissolves, stirring occasionally. Continue cooking the mixture until it comes to a boil, swirling the pot occasionally to keep the mixture from burning. Once it boils, let it cook, undisturbed, until it reaches 254°. 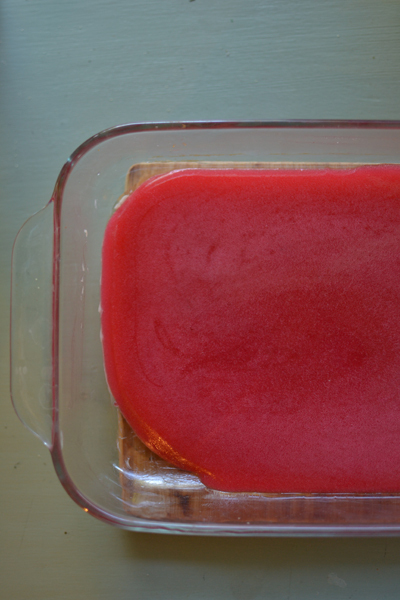 Remove the pan from the heat and stir in the baking soda, flavoring, and food dye. Be careful when you add the flavoring, since it might bubble and steam like crazy for a few seconds. Pour the mixture into a well buttered cookie sheet or baking pan and allow it to cool to a touchable temperature. 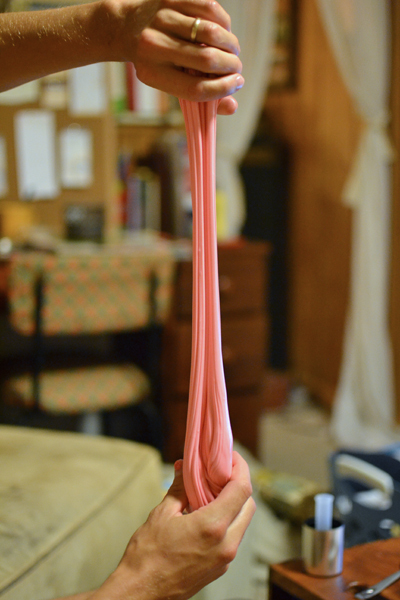 Once the taffy is cool enough to handle, butter your hands well and scoop the taffy into a ball. Stretch it until it becomes light and opaque, and has a satiny sheen. It will sound almost muffled if you smack the end of the taffy rope back on itself (kind of like styrofoam…it is full of air, after all). It should also develop grooved striations along the length of the candy as you pull. This will take anywhere from 15-30 minutes. If you’re doubting whether it’s done, just keep pulling for a while longer. Taffy after 5 minutes of pulling. Notice how it looks opaque. 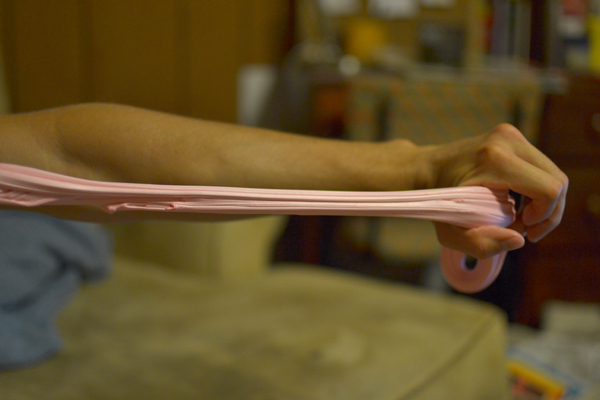 When you’re satisfied with how long it’s been pulled, roll the taffy into 1/2″ thick ropes. Cut them into 1″ long pieces with buttered scissors and wrap them in parchment or waxed paper. These will keep for several days in the fridge or an air-tight container. *A note on flavoring: you have more options when it comes to flavoring the taffy. You could add a couple of packs of Kool-aid mix if you want a tart, fruity flavor. A few pinches of citric acid can boost the sourness if you like. I’ve done this and it came out really well. LorAnn also makes candy flavoring oils, which are 3-4 times stronger than extracts, so adjust the quantity accordingly. I’d start with 1/4 t. and work from there. They offer some flavors, like cinnamon and cotton candy, which are hard or impossible to find as extracts. Tags: candy, gluten free, recipe, summer, taffy. Bookmark the permalink. Thanks for sharing this recipe! I’m going in to the kitchen right now 😊 Can’t wait to see how it turns out! This one may be shared on my blog as well!!! Yes, feel free! Glad you liked it. I love salt water taffy! Especially when I can go to Ocean City and get it at Dolle’s! Best ever! I’d love to try making it sometime, but for now, I’ll just look at the pictures, read the directions, and be glad that someone else can do it! When u add kool-aid, how many packs do u add to 1 batch?